Originally I wanted to write a “what I did this summer”-post but yesterday held a big knitting disappointment for me. Which made me realize that this only was the last straw on top of a dozen or so other disappointments. None of them major and all together enough to make me feel very – meh. See, even the camera has a blurry eye… And then I remembered why I haven’t knit anything besides scarfs and socks for years. The problem is that for about twenty years knitting my gauge was always way too lose. Every thing I knitted ended up to be too big. Then I had enough of this and I taught myself to knit more tight. 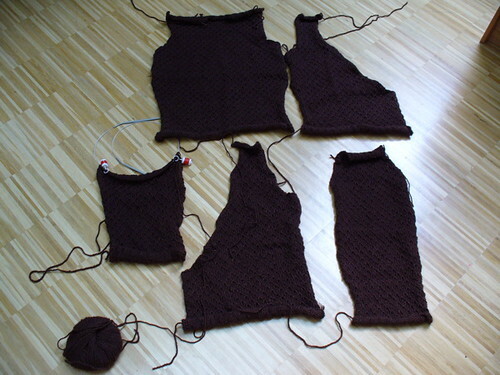 Since then every single thing I knitted ended up too small. I forgot all about this when I started knitting that cardigan. I thought if I did everything right there wouldn’t be a problem. Until about two months ago I held one of the finished sleeves to my arm out of sheer curiosity. It was, well, about three sizes too small, but we all know that you can block it and then it will turn out right, won’t it? Right? It was about that time that my sister asked me for leftover yarn. She wanted to knit for charity. I didn’t know there was such a thing in Germany. I had heard about such things in the US but never here. Then, on the other hand, it isn’t as if I were knowing vast amounts of people who like to knit. There’s my mother, my sister and my aunt and that’s that. Of course I immediately started knitting for that on my own. 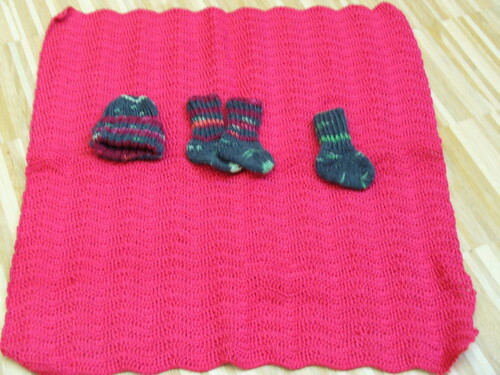 Knitting for preemies. Stricken für Frühchen. For hospitals. Yes, those are three socks. I still have to knit another one because then I started reading knitting blogs like this one and then I had to start knitting jaywalker socks for my husband immediately. I knitted the first sock on our way to Paris and back, finished it only to find that the fit was terrible, revisited the pattern, found out that it was a very bad idea to knit the heel differently on a whim because it left me with a foot that was much too wide. Then I unraveled it. And since there was another mistake early on I had to unravel the whole thing and start over again. I just finished it for the second time. You know I thought I was a quite experienced knitter. I can do all the techniques. Only now I am feeling a little low. 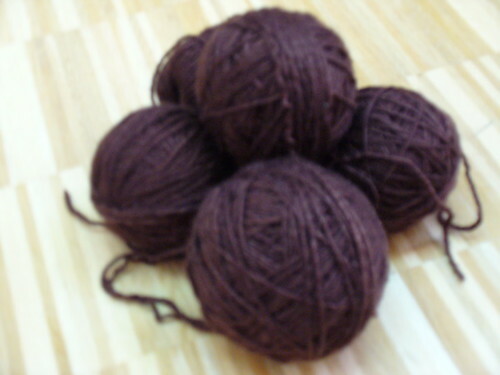 I would be a nice change to knit something that would go right the first time and then actually fit. I won’t give up though. I took me about four months to almost finish that cardigan the first time around. Well, January is a nice cold month. No problem. But first I’ll knit the second of my husband’s socks. And the second teeny tiny baby sock. ooohhh. I love those little things all laid out on a blanket. It looks like an art installation. It is not quite the same thing but after doing three weeks of prelimanary research for an University project I have suddenly decided to change topics five days before my proposal needs to be handed in. My daughter was a premie and I would have loved those socks! She got a very lovely quilt that kept the glare out of her eyes but something to keep her little feet warm would have been wonderful!!!! Now, Do a gauge swatch. If you know you knit like wayyyy too loosely then go down a needle size or more, if you have to OR, knit one pattern size down and it should fit you fine. And this is the reason i do not knit. My mother one made be a beautiful fisherman’s knit sweater that was 2 sizes too small and sleeves that were about 5 inches too long. My mother thinks i am an orangatang. The Wind How can one learn to enjoy the process?